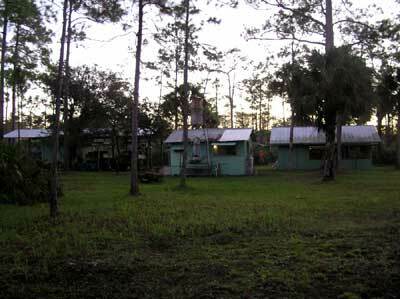 An early morning view from the west side of Camp SixPack on opening morning of the hunting season in the Big Cypress Swamp. This November morning, unseasonable warm weather is greeted by sleepy hunters not quite awake, but eager to get on their morning stands. Someone with sharp eyes will see a hunter in the picture taking an early morning nature call. The sun not quite breaking day, the dedicated hunters are already in the swamp looking for their quarry. This sleepy hunter is trying to catch up and not miss his opportunity to be successful in getting some game. This new view of Camp SixPack, only recently being available, because the fire break around camp had been improved during the summer. The hunting gods must be worshiped to have any chance for success. 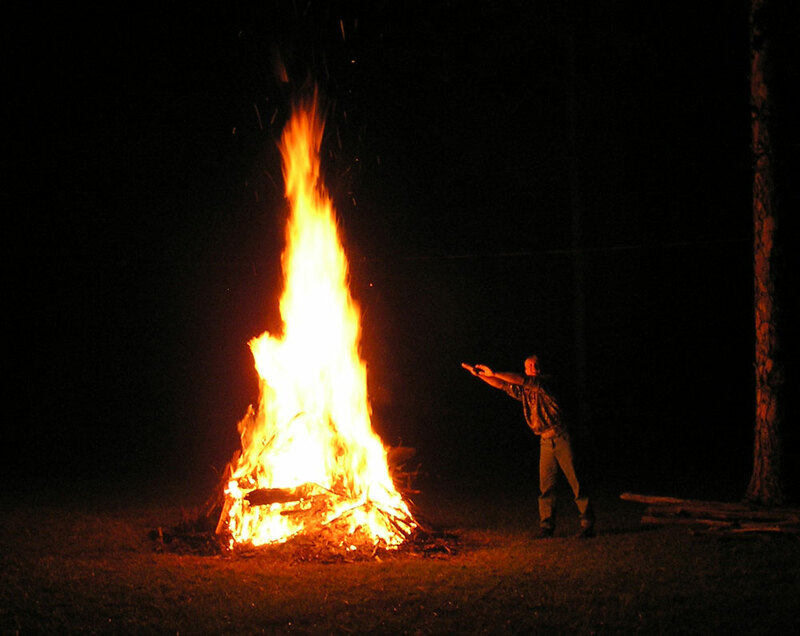 Here is Rich doing the ritual the night before the hunting season begins. Its a ceremony that can not be revealed to those that are not believers. The intricate steps involved must be followed to the letter or a successful harvest will not be had. The more that participate, the better is the result. The only part of the ceremony that I can reveal is that alcohol is involved. 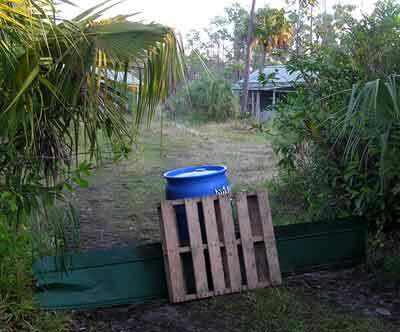 The NPS at Calusa Camp has placed temporary gates at the entrance to the property. They have also installed cameras on the property. They recently experienced a situation that is a concern of the private property owners in the area. 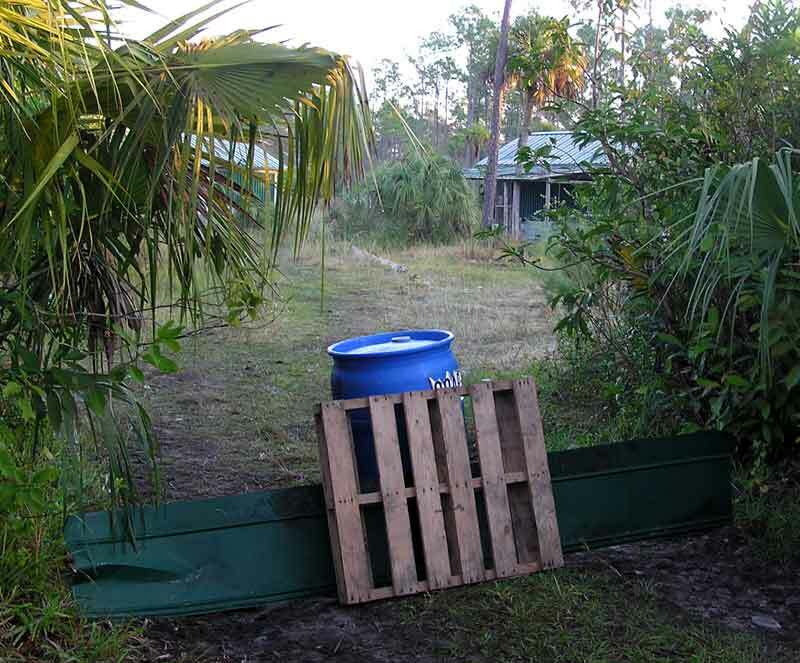 A group of ATV riders were mistreating the camp property. Riding their ATVs over the camp lawn, jumping the ATVs on the property, throwing trash around and in general not respecting the property of others. Needless to say, alcohol was involved. One of the nearby private property owners went over and asked the ATV riders to leave and they complied. 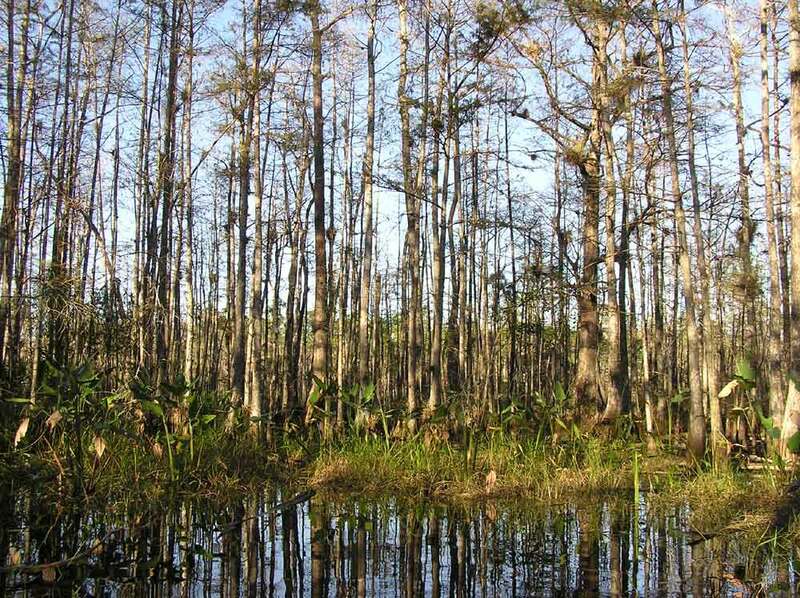 While it is expected that all people have equal access to the Preserve, there are some small parcels of property that are not part of the Preserve. These private land holdings are there at great effort. Please respect those properties and treat them as you would expect your own property to be treated. 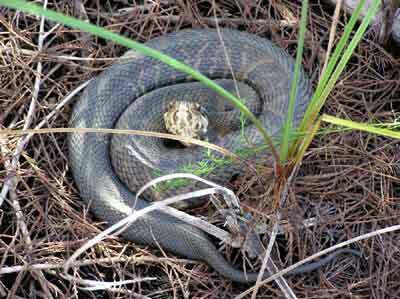 On watch, this water moccasin was comfortably sunning him (her) self, midmorning in the outer ring of a cypress head. Perfectly happy just to lay there coiled up, able to strike, but not wanting to and just enjoying the morning. It didn't seem to mind me passing by and stopping to take a few pictures. It did not even bother to show me the "cotton mouth" that provides it with its other name. This one was not a big one as they can be, but even in this size they still have the venom the big ones have. So! its always a good idea to watch your step as you explore the swamp. 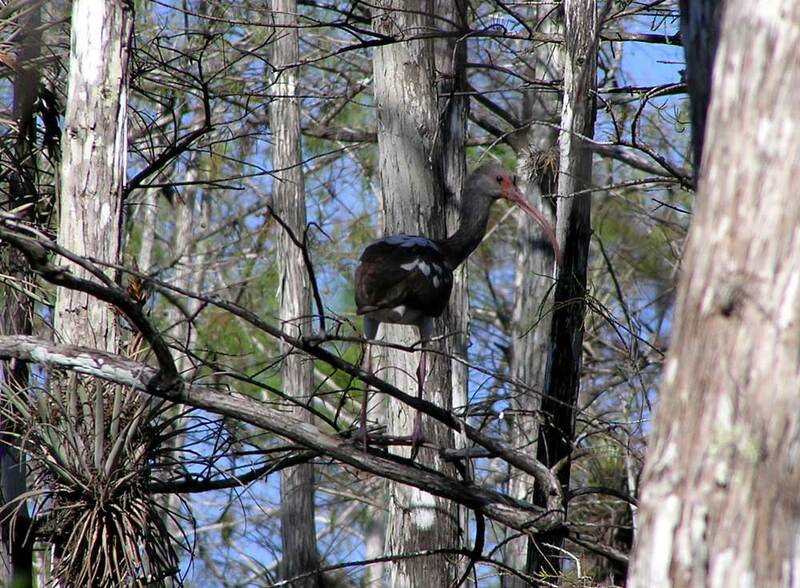 Here is a juvenile Ibis, one of many in a flock up in the cypress trees. 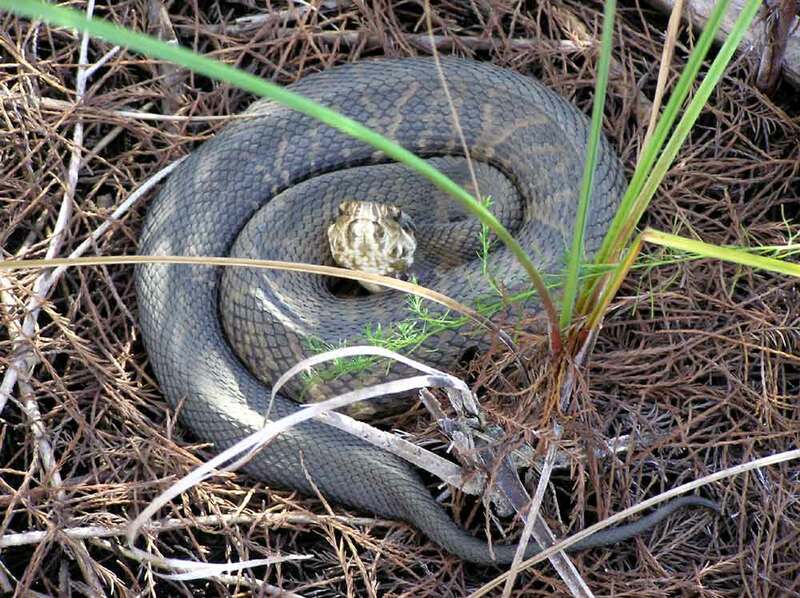 This picture was taken just a few steps from where the water moccasin was coiled up and just a few seconds later. It has been my experience that there are some periods of time during the day that animals are just more visible and available to be seen. 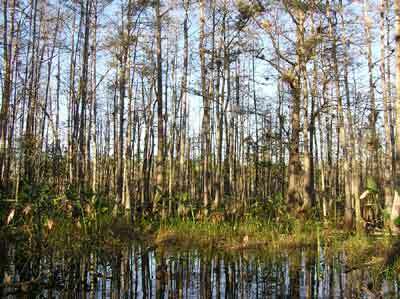 A lot of hunters believe in the periods of the moon, peak periods of feeding times during the day, where animals are more active and the biorhythms of the swamp. Some hunters so strongly believe in this, that they don't bother to hunt until those times of the day. Unfortunately, its not the same time each day, so a person like me, that is not in tune with those biorhythms, just has to stumble into them, rather then know when they will be. Makes it tough! On a dark night, the Skunk Ape lurks amongst the cypress trees, along with the other swamp nymphs of the night. 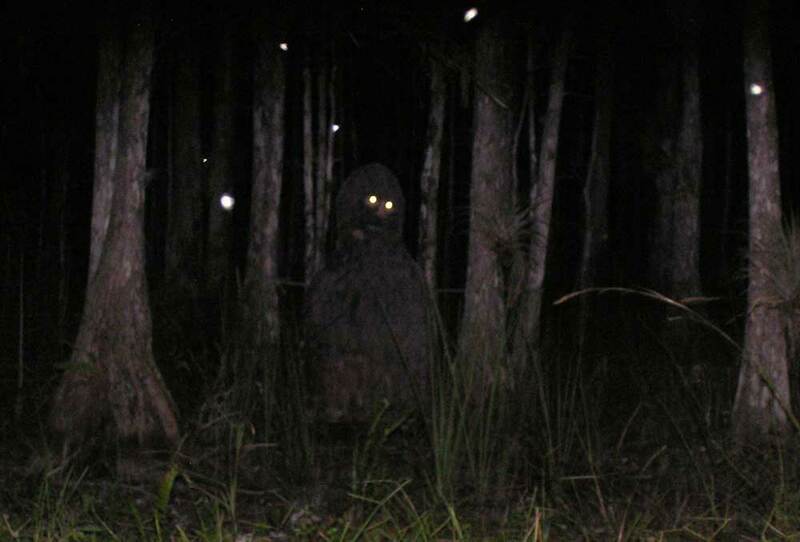 Just a lucky camera shot capturing these allusive creatures, that allude the eyes of a normal person in the dark. While some say they have seen these creatures, it is usually when alcohol is involved and the credibility of the person is always brought into question. Well, there is definitely alcohol involved here. 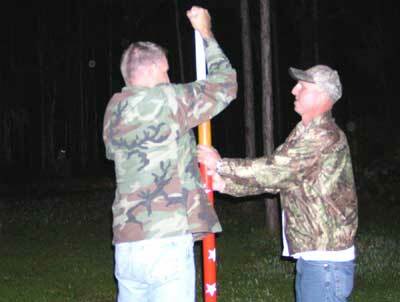 Two people from Bears Den Camp rush to load a potato gun, claiming to see a skunk ape out in the darkness. Just what is that out to the left of them? Actually it is the annual Skunk ape Shootout, held opening day of hunting season. 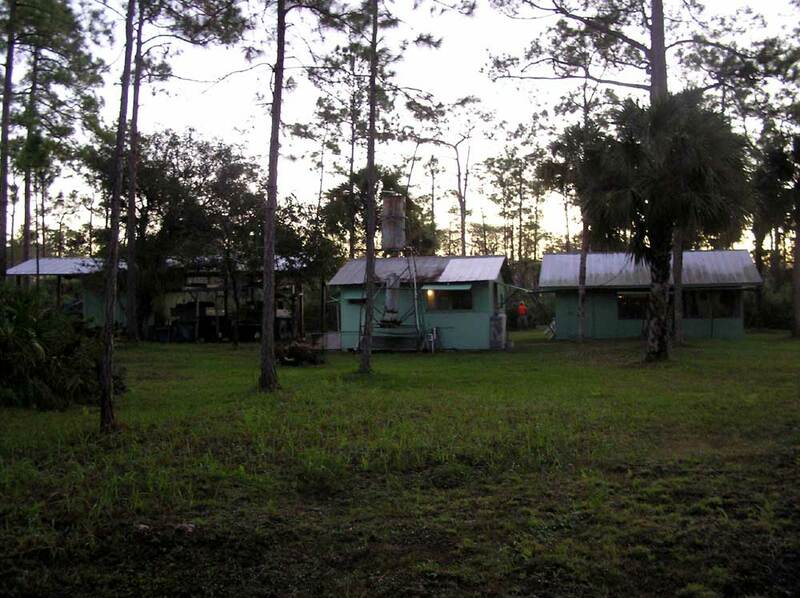 This year the shooting was open to anyone that wanted to try their luck at bagging the Skunk ape. More misses then hits, the two people that successfully hit the Skunk ape went into a shoot off to determine the final winner of the prize. In the shoot off, neither one could hit the target again. Since both of them were from the same camp, the prize was sent home with them, for them to later determine who the ultimate winner is. A spider web catching the morning light. 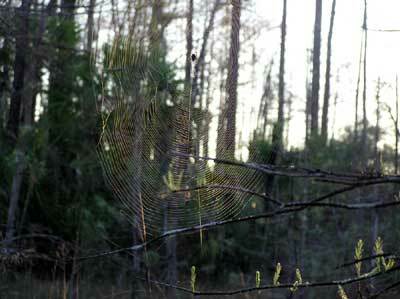 The detail weaving of the web during the night, leads to a morning catch of bugs for the spider. The web material is stronger then steel and manufactured on the go by the spider. The industrious spider weaving then keeping the web in repair as the morning goes on. Each bug stuck in the sticky material gets instant attention and is wrapped in a cocoon of web material for a latter meal. Bugs to big for the spider either break free or the spider cuts them free so they do not damage the web. 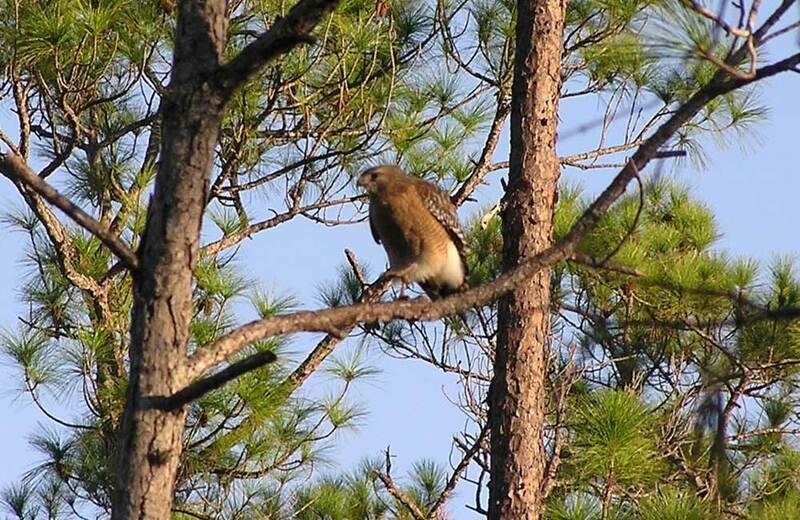 A red shouldered hawk is just landing on a branch in this picture. A mating pair of hawks has made a nest in one of the pine trees at Camp SixPack. They screech a hello every time we venture into their sight. They spend most of the day hunting and then returning to the nest to feed their off spring. Not unusual to see a hawk go by with a wiggly snake in its grasp or a mouse, (usually not moving much), land at the nest to the open mouths of little chicks. 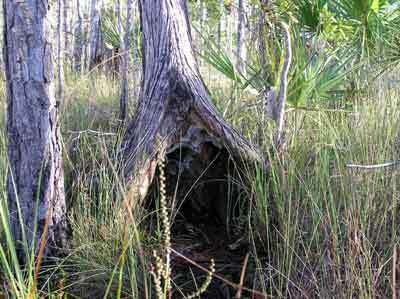 What you see in the picture here is a big cypress bee's nest. The hollowed out opening in this very alive cypress tree has a very active nest in it. While I said it was a bee's nest, it may actually be a hornet nest or a yellow jacket nest, but I didn't want to get all that close to find out. 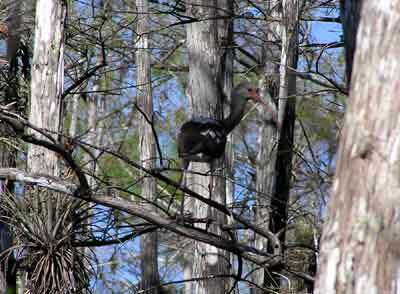 If you click on the picture, you will get a close up view of the nest opening and a few of the occupants. 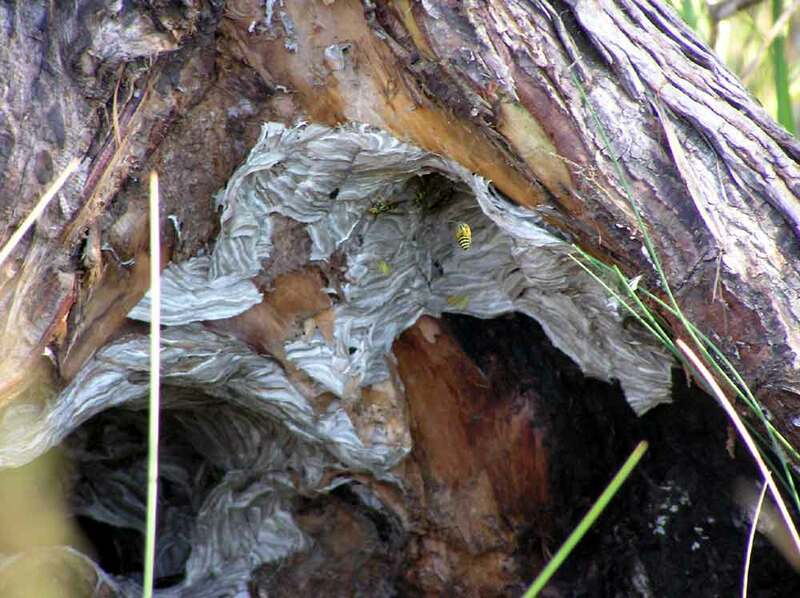 You can decide for yourself if they are bee's or hornets or yellow jackets? A parting picture of the cypress head just outside of Camp SixPack taken from the middle of the hollow center. A good example of how the swamp looks in November, with the water receded, just some remaining in the wet center pond.